Heat oven to 350°F. On ungreased cookie sheet, place biscuits 1 to 2 inches apart. Cut each biscuit into quarters, but do not separate pieces. In small bowl, beat egg and 1 tablespoon water. Brush egg mixture over tops of biscuits; sprinkle with sesame seed. Bake 14 to 17 minutes or until golden brown. Cool slightly; separate biscuit quarters. Meanwhile, in 2-quart saucepan, heat oil over medium-high heat. Add onion; cook, stirring frequently, until onion is tender. Stir in chili sauce, 1/4 cup water, the mustard and chili powder. Cook 3 to 5 minutes, stirring frequently, until slightly thickened. Add meatballs to chili sauce mixture. Cover; cook over medium heat 8 to 10 minutes, stirring occasionally, until meatballs are hot. Split each biscuit quarter to make tiny bun. 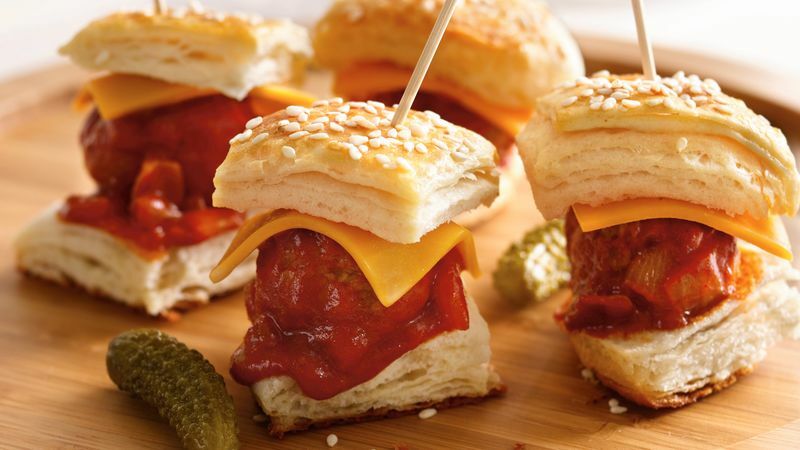 Fill each bun with 1 cheese piece, 1 meatball and some of the sauce. Secure with toothpick. Experiment with different, cheeses such as Cheddar, Gouda or Monterey Jack with jalapeño peppers, to create a new taste sensation. To save time, purchase dinner rolls or dollar buns instead of making your own.